Another day, another #womenshistoryreads interview! 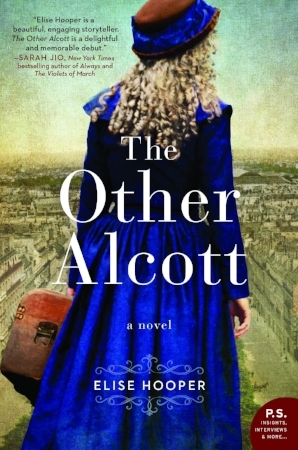 Today I'm talking to Elise Hooper, author of THE OTHER ALCOTT, about historical fiction (of course), revisions that today's history textbooks need, the fascinating Dorothea Lange, and how moviegoers are getting the wrong impression of Jenny Lind. Elise: I write historical fiction about women who haven’t received starring roles in traditional retellings of history but tend to be lurking, largely unobserved, in the footnotes and endnotes of non-fiction books. These women have often played an important role in history but tend to be undervalued. In the case of May Alcott, my main character in The Other Alcott, she was a trailblazing painter of the 1870s but people tend to focus their attention on her much more famous older sister, Louisa. When I think about my characters and their stories, I’m particularly interested in exploring how women have navigated the call to produce creative work while balancing their ambitions with love and family. Elise: I couldn’t get enough of Prairie Fires by Caroline Fraser. As a girl, I adored the Little House books and read them over and over, made my dolls calico dresses and bonnets, and threw sheets over chairs to create covered wagons in my family’s living room. In the 1980s, when the Little House television series aired, I fell in love with Melissa Gilbert’s plucky little “Half Pint” and never missed an episode. When my own daughters reached the age to be introduced to the series, I read along with them and discovered a whole new experience. The risks the Ingalls took both fascinated and horrified me. I hadn’t understood the family’s extreme poverty and many run-ins with danger when I read the books as a child, but as an adult, I was astounded. Prairie Fires brought it all to life and Caroline Fraser did an excellent job of framing the Ingalls’s experience with both a wide-sweeping historical lens and psychological analysis of the real people behind the beloved characters. In this excellent non-fiction book, the Ingalls family becomes a fascinating touchstone to learn about a period when our country experienced astounding economic, technological, and social changes. Elise: I’m working on revisions for a new novel about Dorothea Lange, the pioneering documentary photographer of the 1930s and ‘40s. While most Americans recognize her work of Dust Bowl migrants, especially her iconic “Migrant Mother” image, few know much about the woman behind the art. Her story is a remarkable one about a woman persevered with her professional ambitions despite many challenges, including a physical disability due to a childhood bout with polio, a troubled marriage, the privations of the Great Depression, and the government’s censorship of her photos. She made many difficult decisions that will fascinate modern readers. This novel will be released in early 2019 by William Morrow. Greer: That sounds fabulous! Can't wait. Elise: My question for you: I’m obsessively watching "The Crown" these days and find myself forming a whole new impression of Queen Elizabeth II. Who do you think is another woman whose story has been largely misunderstood and could make for an intriguing television series? Greer: I'm clearly biased, but I think Kate Warne, the first female detective and the subject of my latest novel GIRL IN DISGUISE, would make a great subject for a TV series. Not so much that her story has been misunderstood, more that it is rarely discussed at all!